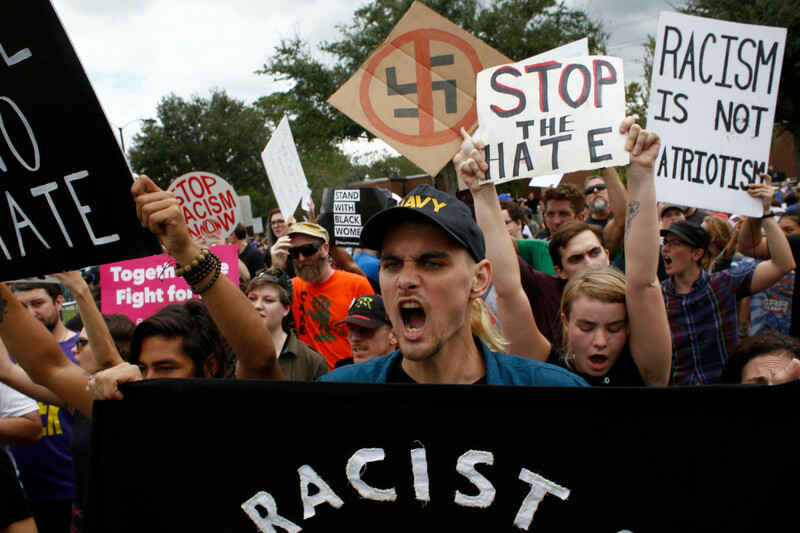 Demonstrators gather at the site of a planned speech by white nationalist Richard Spencer at the University of Florida on October 19th, 2017, in Gainesville, Florida. The white nationalist Richard Spencer has attempted to position himself as the intellectual face of the American far right, in part by his incessant attempts to speak on college campuses. 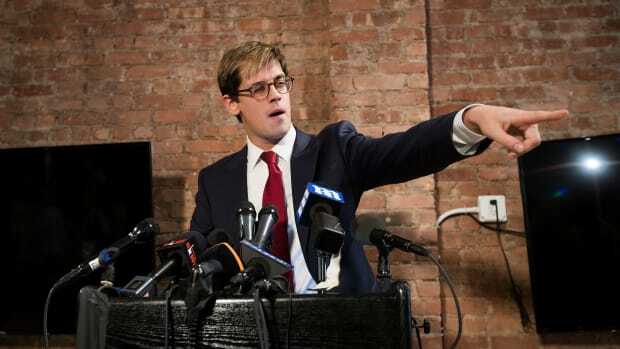 Other public figures representing various stripes of the far-right have been profiteering and recruiting via speaking appearances on, or near, campuses. So-called "alt-right" writer Milo Yiannopoulos—who planned to publicly name undocumented students at the University of California–Berkeley earlier this year and harassed a trans student at the University of Wisconsin–Milwaukee in 2016—enjoyed his own well-funded university tour last year. These speakers tend to ride in under the banner of free speech, but their intent is much more insidious; too often, university administrators fall for their specious arguments. 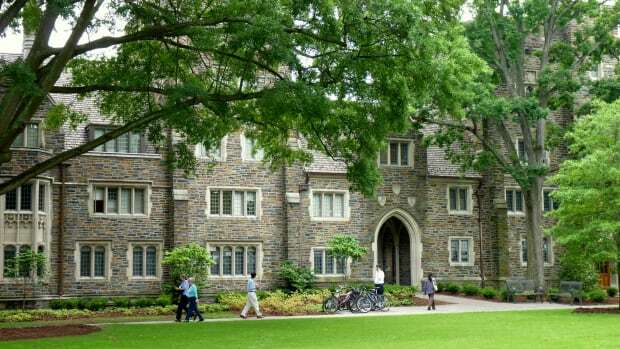 Universities therefore remain a prime recruiting ground for white nationalists and other extremists, in the process jeopardizing their own most marginalized students. As a result, students have become the primary defenders of their campuses from far-right forces. Many schools, including Auburn University and the University of Florida, have initially canceled events featuring far-right figures before ultimately allowing the speakers to appear on campus. Campuses have frequently decided to permit extremists only after the speakers threatened to sue over alleged First Amendment violations. While official university statements on far-right speakers have often included condemnations of racism, homophobia, and other forms of bigotry, they have also mimicked the far-right&apos;s suggestion that the main thing at stake is free speech. After protesters at DePaul University in Chicago rushed the stage during a Yiannopoulos speaking event last year, former university president Dennis Holtschneider wrote a letter apologizing for "the harm that was unleashed" by Yiannopoulos&apos; appearance, but defended the school&apos;s decision to host Yiannopoulos by asserting that DePaul has a "high bar" for free speech. 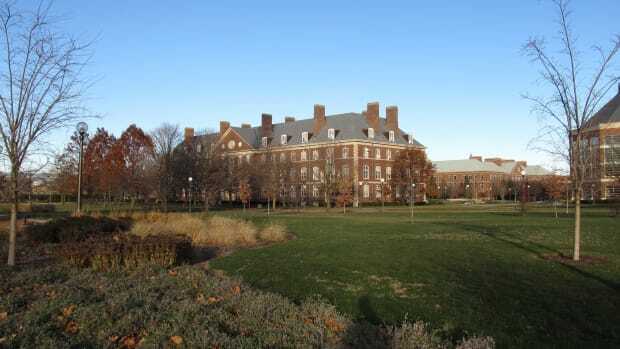 Yet even as they invoke free-speech concerns and persuade universities to follow suit, far-rightists do not intend merely to express themselves or engage in good-faith debates when they visit universities. 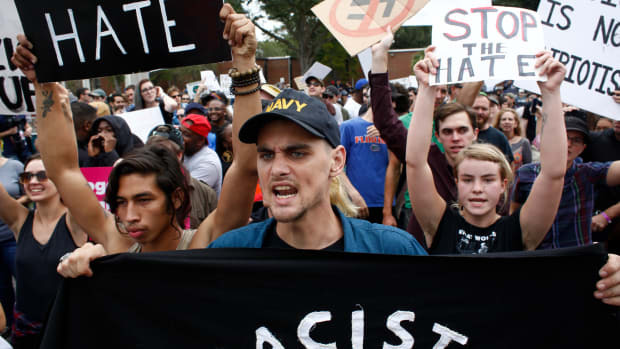 According to Lecia Brooks, outreach director for the Southern Poverty Law Center, white nationalist and other bigoted figures tend to enter campus with a more sinister agenda: to recruit newcomers to the far right and provide a space for like-minded bigoted students to gather together, in effect helping them organize at school. "This is how Richard Spencer got people from all over the country to come to Charlottesville [for Unite the Right]," Brooks says. The white nationalist Unite the Right rally in Charlottesville, Virginia, in August was preceded by a tiki torch-lit march, in which Spencer participated, on the University of Virginia&apos;s campus. When schools ostensibly buy into the far right’s specious free-speech arguments, it "adds legitimacy to the idea that all we&apos;re talking about is speech," Brooks says, when in fact we&apos;re talking about the strong possibility of violence and the spread of dangerous extremism. Speaking engagements represent just one element in the campus recruitment strategies of far-right groups. Since March of 2016, the SPLC has recorded 329 occurrences of flyering from far-right groups on 241 college campuses around the United States. In the past year, flyers from white supremacist groups, including Vanguard America, a white nationalist group involved with the Unite the Right rally, have targeted college campuses. Some of these flyers contain explicitly violent messages—one Vanguard America flyer reads, "White Revolution Is the Only Solution" and features an image of Adolf Hitler giving the Nazi salute. James Alex Fields, who allegedly killed Unite the Right counter-protester Heather Heyer, was later identified as a member of Vanguard America, and the organization has since rebranded as "Patriot Front." 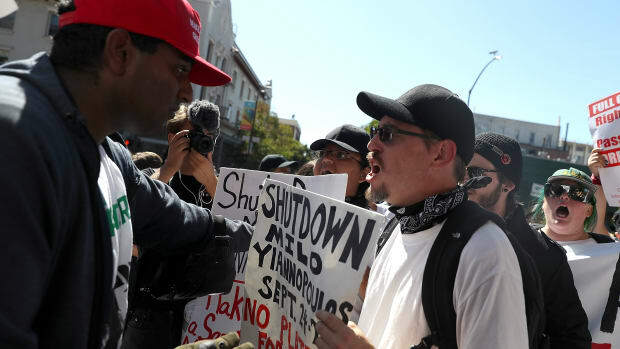 At the same time, there have been several instances of violence by supporters of far-rightists on college campuses. At a Yiannopoulos event at the University of Washington in January, 29-year-old Elizabeth Hokoana shot 34-year-old Joshua Dukes, a member of the Industrial Workers of the World, in the stomach, according to a Seattle Times report. When Spencer appeared at the University of Florida in October, three supporters verbally harassed counter-protesters and threw up Nazi salutes before one fired a shot in the crowd and the group sped away in a Jeep. Nobody was hurt, but the three men, Tyler Tenbrink and William and Colton Fears, were arrested for attempted murder, the Miami Herald reported. Tenbrink and Fears had participated in the Unite the Right rally, and all three men were identified as members of extremist groups. The presence and organizing efforts of far-right groups and speakers on college campuses can be particularly harmful for marginalized students, Brooks explains. Speaking events by Spencer and his fellow-travelers are "very disconcerting to historically marginalized groups" and can be "traumatizing and anxiety-inducing," Brooks says. She adds that even while schools sometimes "say all the right things" when condemning far-right speakers, universities have typically failed to adequately support marginalized students. As a result, it falls to students to defend their campus from hateful extremists, and from the policies that shield those extremists. Accordingly, when far-right figures appear on campuses, liberal and leftist student activists have organized against the speaker but also against the university policies they say are inadequate to keep marginalized students safe. Student activists&apos; acts of double defiance sometimes include methods not sanctioned by their schools, meaning students often risk formal sanctions for acts of protest. Student activists at the University of Florida got national attention in October when Spencer spoke at the school. UF President W. Kent Fuchs issued a statement saying, "I personally find the doctrine of white supremacy abhorrent and denounce all forms of racism and hate," and encouraged students to "stay away" from the event—but he still let it happen. 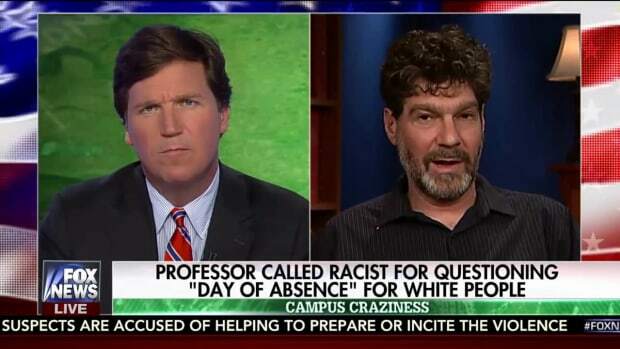 Some students argued that Spencer&apos;s presence alone was cause for other action: When the university failed to meet student demands that the event be canceled, students planned to protest the event by drowning out Spencer&apos;s speech. Chad Chavira, a third year UF student who was a lead organizer for the "No Nazis at UF" protests against Spencer and runs the Twitter account @NoNazisAtUF, tells Pacific Standard that the school&apos;s official response to the event was "extremely disappointing." Chavira says that, while Fuchs condemned Spencer&apos;s views, he also "told students to stay home and discouraged us from protesting," and did "nothing to support marginalized students, especially protesters." Students opposed to Spencer&apos;s event marched on Fuchs&apos; office in a "last-ditch attempt to open a dialogue with administration," Chavira says, but the president locked the doors to his office. Dissatisfied with the administration&apos;s failure to keep Spencer off campus, Chavira and other student activists began collaborating on their own actions for the day of Spencer&apos;s speech. Chavira says student activists and radical community groups formed a coalition organized around the goal of "not allow[ing] Spencer to spread his white-nationalist ideology." The activists were largely successful: Hundreds of protesters filled the auditorium where Spencer spoke, shouting down his speech with chants of "Black lives matter" and "Go home, Spencer." A crowd of 2,500 more protesters, including students and community members, amassed outside. Student activists were concerned about giving Spencer a platform to propagandize, and were also unhappy about the financial resources the school poured into the event. The school spent an estimated $600,000 on security for Spencer&apos;s speech, and Chavira points out that several university buildings, including museums and parts of the university&apos;s hospital, were closed down. Chavira says that "workers [who work in the closed buildings] have yet to receive pay for days missed due to factors outside of their control, and it also affected students and other community members who had to reschedule or cancel appointments." Following the protests, Fuchs wrote a an opinion column in the school paper praising the campus community for "turn[ing] a potentially dangerous situation into a peaceful outcome," but included criticism of protesters as well. Echoing language he&apos;d used in his earlier letter, Fuchs further wrote, "shutting down Spencer [is] ... exactly what white supremacists need to attract attention and followers." Fuchs’ column included criticism of some student protesters&apos; methods, but failed to mention the gunshot fired into the crowd by Spencer&apos;s supporters, demonstrating a troubling lack of understanding around the danger Spencer&apos;s presence poses to students. Chavira notes that Fuchs never even reached out to student organizers, something he could have done if he was concerned about their methods. While the University of Florida forced some employees to take unpaid days off, had patients reschedule medical appointments, and criticized student protests, Chavira says that the school isn&apos;t doing nearly enough to support its most marginalized students. Though Spencer&apos;s speech is long over, Chavira and other students are advocating that the school launch an African Studies department, offer more scholarships to marginalized students, and implement "more training around racial and social justice for all members of UF." Students are also sometimes formally sanctioned by their schools for peaceful protest. In March, the controversial political scientist Charles Murray (whom the SPLC labels a white nationalist) spoke at Middlebury College, and was met with protest from dissenting students. Dozens of students filled the room where Murray spoke, turned their backs on him, and drowned out his speech with chants, according to a New York Times report. Counter-actions to Murray&apos;s event garnered national attention after a small group of protesters, who may not have been Middlebury students, surrounded Murray and his faculty interviewer after they left the building. The incident included "a lot of pushing and shoving," according to a statement issued by Middlebury&apos;s president, Laurie L. Patton. Murray, who was also later protested at a Harvard University event, received an apology from Patton. But 74 student protesters—who were not identified in the skirmish involving Murray and Stanger—were disciplined for "participating in disruptive actions" during the speech, according to a statement from the school. While universities continue to allow dangerous speakers on campus, students will continue to find themselves bound to protest not just the speakers, but also their schools&apos; own administrators. Of course, college students have a long history of protesting social injustice, a tradition that Brooks is confident will continue. As the far-right has become increasingly emboldened in the Trump era, Brooks notes that there has also been a surge of student activism. Students will "hopefully be able to change the narrative," Brooks says, and push universities to favor the well-being of marginalized students over the supposed free-speech rights of extremist con-men who incite violence. Milo Yiannopoulos announced an event without booking venues or speakers. Now he's crying oppression, and the media needs to stop falling for it.